SP Page Builder is trusted by 400,000+ people worldwide. This Joomla page builder is an extremely powerful drag & drop tool. Whether you're a beginner or a professional, it lets you build a site independently! "Shaping websites become easier with SP Page Builder and it's a really interesting product. I strongly recommend this tool." What Makes SP Page Builder the Best? SP Page Builder features a shiny new frontend editing system. The Joomla page builder offers the fastest and most convenient web development experience. Watch your customizations LIVE in real-time, no popups, no preview! The Joomla page builder offers groundbreaking responsiveness controls that empower you to make websites fit for each and every device. While editing, you can load your site right on-board in mobile, tablet and desktop views to check the responsiveness and tweak if required. The award-winning drag and drop system of SP Page Builder makes it super easy to build a website. Everything is there on the Joomla page builder sidebar, you just drag and drop them on your site. Make the necessary tweaks using the live frontend editor, and you’re ready to rock! 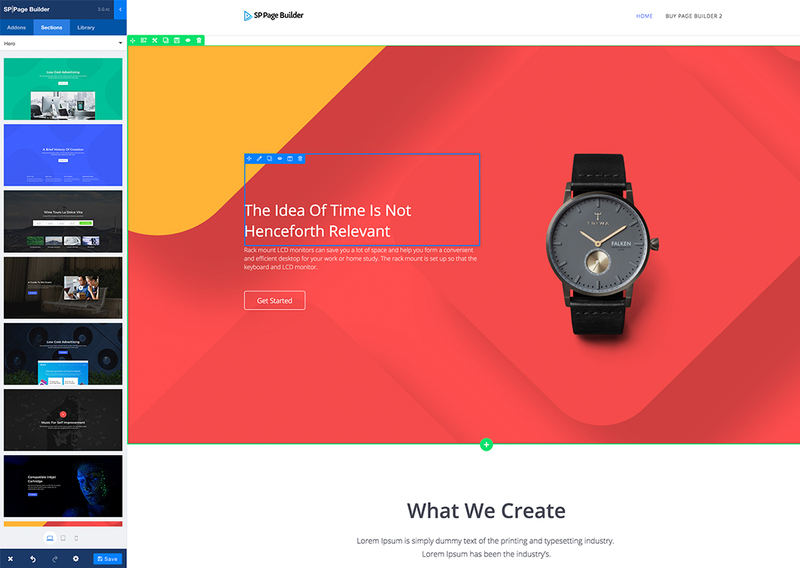 With SP Page Builder, you are all-in-one. Build a professional and functional website in minutes without any coding. Even, no previous designs required. All of these tedious tasks are done by the Joomla page builder. You get more than 90 ready-to-use section designs and around 25 complete page layouts to launch any site in a few clicks. We offer a rich collection of pre-designed page layouts in SP Page Builder to speed up your development. Joomla page builder with 50+ addons to help you create a wonderful site. We offer 14 FREE Joomla page builder addons in the lite version for all. Our Joomla page builder works with Joomla articles, and extensions like K2 & J2Store. Edit and style native Joomla articles with SP Page Builder to create rich and professional blog posts. Use SP Page Builder to decorate and manage K2 contents, and ensure offering stunning quality contents. Make J2Store built product descriptions even better using the fantastic SP Page Builder tools and boost sales! Why Build with SP Page Builder ? You got tons of reasons to choose our Joomla page builder. So, why not? SP Page Builder features lots of amazing functionalities that make it the most complete and robust Joomla page builder. With ultrafast tools, the Joomla page builder lets you create full-featured, 100% responsive & mobile optimized sites in a snap. Build your site in real-time. Browse a page, edit elements and see changes instantly. Drag, drop and customize everything live! The Joomla page builder correctly utilizes page title, meta tags, meta keywords, thumbnails and Open Graph data for perfect SEO & SMM. This Joomla page builder minimizes the time & cost required to create web pages by reducing workload. It’s unbelievably efficient. SP Page Builder is compatible with almost any Joomla template, framework and extension.It's a global tool. SP Page Builder offers 100% freedom in languages. You can build sites in ANY language you want! What Makes it Worth Purchasing the Pro Version? There are lots of reasons that make it super worthy having the SP Page Builder Pro. Check what the valuable users around the world say about our Joomla page builder. Your mostly asked queries are answered by our experts. Please check them below. Feel free to knock us for a friendly chat. What is SP Page Builder? 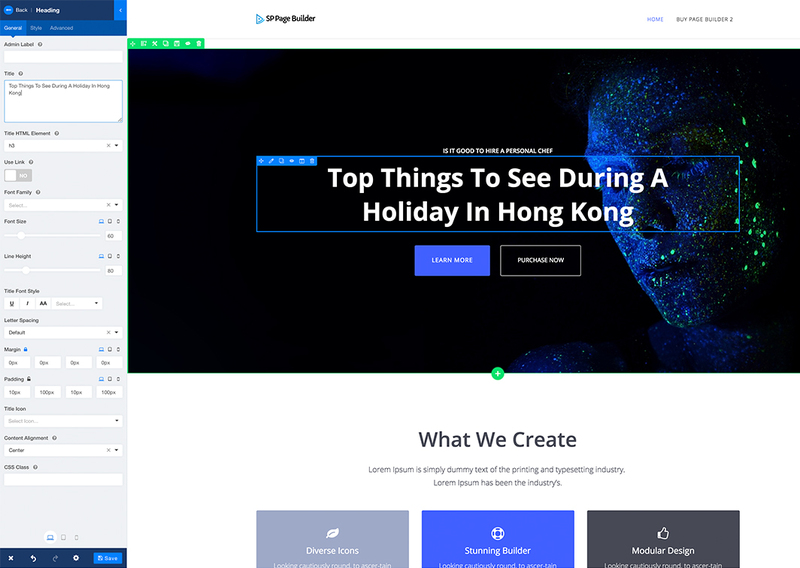 SP Page Builder is the world’s best Joomla page composer tool that you can use to create a site without coding a single line. It lets you build a site in minutes. What are the SP Page Builder addons? SP Page Builder has 40+ addons that you can use to add different elements on your website. For an example, you can add a photo gallery, a contact form, a subscription form, pricing tables etcetera using the Joomla page builder addons. What is the difference between the built-in sections and templates? The readymade Joomla page builder sections are pre-designed parts (built by combining sevral elements) that can be inserted into web pages of any design. The ready-to-use page templates are complete page layouts with several sections and elements arranged to make a full page structure. Can I upgrade from Free to Pro? Yes, you can upgrade from Free to Pro version. In that case, you need to purchase a Pro version and install it on the top of your existing free version. The Joomla page builder will keep your current page designs intact and upgrade the free version to the Pro version. How can I pay for the component? While you’re on the pricing or product details page, click the Buy Now button. After that, on the checkout page, you can make the payment. We accept payments from PayPal, MasterCard, Visa, American Express and all major credit cards. We do not store payment/card information in our server. The price is a one-time payment, not a monthly fee. You pay for a one-year license. No hidden or recurring charges of any kind, and there's no limit on how long you can use the template or extension either. Once your subscription expires, you will still be able to use & reinstall the component - but you will not be able to download updates or access the support forum. Free community support may be available on our Facebook group. The pages you've built with the SP Page Builder Pro will work after the subscription expires, but you would not be able to use the Pro features while creating NEW pages. You can still use the free features. Plus, once the subscription expires, the Pro license key becomes invalid. What if I pay for a subscription and I am not satisfied? JoomShaper has a 7-business-day money back guarantee. If you are not satisfied with our products, we’ll offer you a refund (up to 100%). We follow a standard refund policy which you can find on this link. Yes, you can do it at any time without losing pages created before. Upgraded version will add the new features to the current installation and keep your current data and settings. Does it work with templates from outside JoomShaper? Of course! SP Page Builder works with any Joomla template or framework developed by anyone. SP Page Builder is just a Joomla extension which doesn’t conflict with other extensions, templates or frameworks. Can this be used on non-English websites? You can use SP Page Builder on sites in any language whether it is English or not. The tool supports RTL (Right To Left) languages such as Arabic, Hebrew etc. Sure! We have a talented customer support team for SP Page Builder Pro users. We offer dedicated support for a full year (or as long as you continue the membership subscription) to the Pro users. There is a Facebook discussion group as well where both the free and Pro users can ask/get community support. Pro users can get support for SP Page Builder on our forums. Our dedicated Facebook group is open for both the free and paid users to discuss and share everything about SP Page Builder. How long you offer support for SP Page Builder? SP Page Builder Pro users get our forum support as long as they have an active subscription with us.